If you want to sign up to become a Beta tester for Blizzard’s upcoming games, now is the time to do it! How? Just go to battle.net’s website, make a Battle.net Account if you haven’t already, and then register one of your games from Blizzard. Once you have your Battle.net account set up, you will be able to access “Beta Profile Settings” under the Manage My Games area. When you get in the Settings page, you will have to download and run the Battle.net System Check program which will send Battle.net your computer hardware information. 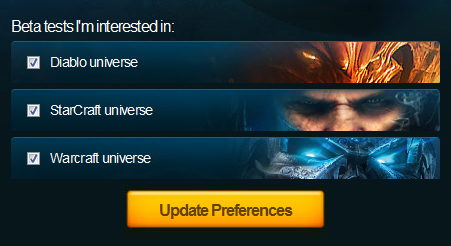 Finally, after that’s done, you will be able to select the beta tests (from the “Diablo universe”, the “StarCraft universe”, and the “Warcraft universe”) that you are interested in. Good luck, and hope you get chosen for beta testing!